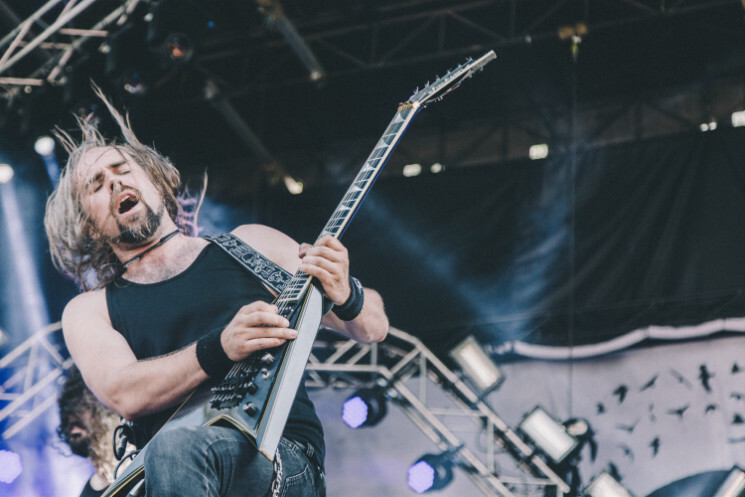 Those who had arrived to see melodic metallers Insomnium kick off their first North American headlining tour were greeted with a few different yet familiar faces when the band took the stage Sunday afternoon (August 9). "You'll notice the band is short one blonde Finnish person," joked Artisan bassist Mike Bear, who explained he was filling in on the low end and lead vocals for Niilo Sevänen, who was missing the tour due to family issues. In addition to Bear's presence on bass, former Arch Enemy axeman Nick Cordle was on stage in place of Ville Friman, handling clean backing vocals and guitars. The band fared quite well in incorporating their new touring members on stage, fighting through a less than desirable mix that left Bear's deep growl tough to distinguish amidst the virtuosic shredding of Cordle and Markus Vanhala. Through a number of anthemic tracks taken from their latest, Shadows of the Dying Sun, the performance gave every indication that the band had become stronger and tighter as their trek through North America continued. "I see the superfans up front giving me help with the lyrics," Bear noted in praising the crowd for giving them a warm reception. "We'll put you on payroll!"